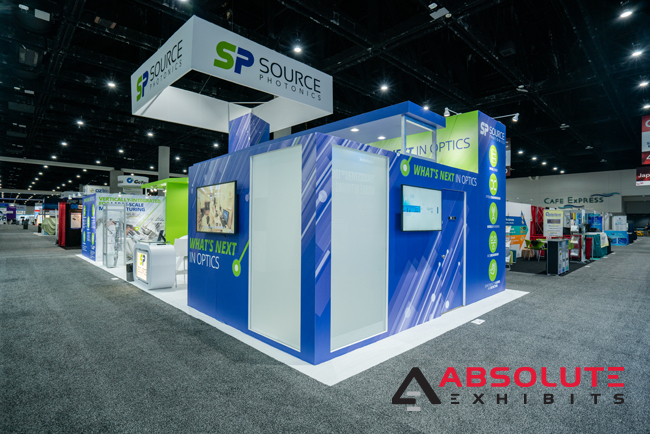 Client Spotlight: Source Photonics at OFC-NFOEC | Absolute Exhibits, Inc.
OFC- NFOEC is the premier optical fiber communications conference and exhibition in the United States. Over 15,000 people gathered from across the world to discuss business and technology solutions such as 5G deployments and network build-outs. With nearly 700 exhibitors on site, industry professionals got a taste of leading optical communications software and business solutions. Source Photonics was among the group of exhibitors, exhibiting their leading optical transceivers in a prominent trade show exhibit. This included optical transmission tools, fixed and wireless broadband and semiconductor lasers and detectors among other products. Source Photonics prides itself on manufacturing the leading optical transmission tools, enabling today’s cloud scale networks and driving network evolution. 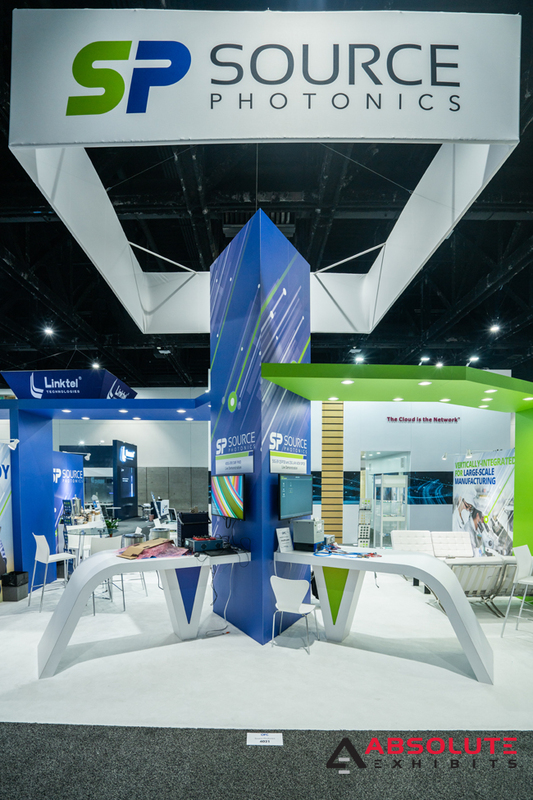 In order to communicate this next generation brand identity, Absolute Exhibits needed to come up with a trade show exhibit that looked like it was next generation, possibly even futuristic. 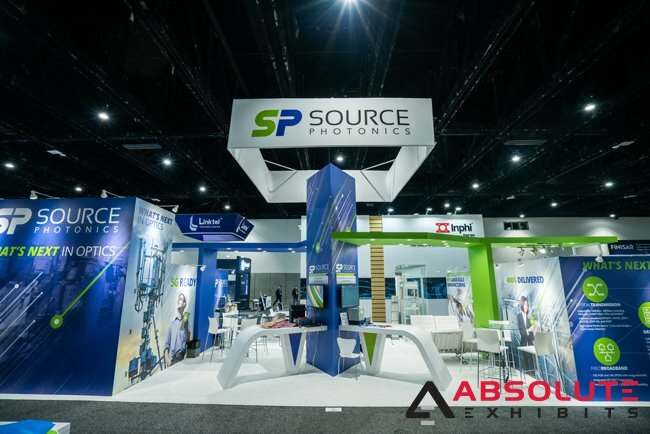 Absolute Exhibits was challenged to create a trade show exhibit at OFC-NFOEC that felt next generation and included meeting space for up to 22 people. The trade show exhibit needed to encourage traffic through the booth and to allow for their booth staff to give demonstrations, encouraging interest in their products. Absolute Exhibits built a customized trade show exhibit with the idea of next generation technology or futuristic in mind. From the 16’ triangular tower with the connecting bridges featuring down lighting to the angled work stations, their trade show exhibit appeared to be very futuristic. Each of the panels was created of CAM and wrapped in dreamscape graphics which hid all seams, giving it a more glossy and futuristic look. To accommodate the expected meetings, two meeting spaces were constructed off of the connecting bridges to allow for up to 22 people to meet simultaneously. Frosted glass lent an air of privacy as well. “Working on Source Photonics’ trade show exhibit was exceptionally fun. We fleshed out an image of what they wanted and through the power of collaboration, we were able to deliver something that hit a home run for the team. We’re extremely proud of this trade show exhibit,” said Account Executive, Don Burks. Source Photonics was a tremendous hit on the trade show floor. Their trade show exhibit drew excited and curious attendees from across the trade show floor, filling their exhibit with people eager to learn more about their optical transmission tools. “We have been working with Absolute Exhibits for more than 5 years now and they never disappoint. Don Burks, our Account Executive, has always been on top of things and he ensures that we have everything we need in order to have a successful show. What I especially like about them is their “nothing is impossible” attitude. They will make things happen regardless of how challenging they are. All the crew from the Project Manager to the stand builders are amazing!,” said Jasmin Basal, Senior Marketing Manager at Source Photonics.